Click the button below to add the U-MARQ GEM-CX5 Cylindrical Engraving Machine to your wish list. The U-MARQ GEM-CX5 engraving machine is a true 4-axis engraver fit for engraving a multitude of both flat and cylindrical items. Designed for placement in a retail environment, the U-MARQ GEM-CX5 is practically silent and pleasing to the eye. A combination of a flat engraving table, jewelry jigs and cylindrical attachments, opens the door to an array of engraving possibilities. Powered by a 100W Brushless Hall Effect DC motor, the U-MARQ GEM-CX5 can reach spindle speeds up to 18,000 RPM and feed rates up to 4.5” (116mm) per second. Composed of stainless steel spindles, lead screws, precision linear rails and a steel chassis, the GEM-CX5 is robust and reliable to a degree that many engraving machines are not. Paired with arguably the most versatile and user friendly software in the industry, the GEM-CX5 engraving machine can interface with virtually any PC or laptop running Windows 7, Vista or XP. Furthermore, the GEM-CX5 bridges the gap between the typical 3-axis, bench top engravers and the top of the line 4-axis, cylindrical engravers, which are geared more towards engraving larger items, such as trophy cups and wine bottles. Clearly in a league of its own, the U-MARQ GEM-CX5 will engrave a vast range of applications in a prompt and efficient manner while maintaining precision and quality, far exceeding your customers’ expectations. The U-MARQ GEM-CX5 is capable of engraving a slew of different materials. Amongst the most popular are metals, such as, aluminum, brass, gold, silver and stainless steel. These materials are generally found in various gift items and can be secured in the vise via one of the many jigs available. Business card holders, money clips, cuff links, dog tags, pendants, pens, flasks and Zippo lighters are amongst some of the more popular metal items engraved. The removable, flat engraving table is ideal for engraving such items as trophy plates, plaques and identification tags. Furthermore, the flat engraving table allows for profile cutting, which is most often used for creating jewelry name plates and push button equipment panels. Acrylic, resins and other plastics are also acceptable materials and are commonly used when engraving small signs, labels and name badges. The cylindrical 4th axis is most commonly used for engraving wine glasses, bowls and champagne flutes. However metal cups, mugs, trophies and tankards are easily engraved as well. As if that wasn’t enough; with the optional ring and bangle attachment, one can engrave 360° around the inside or outside of rings, wedding bands, hoop earrings and bangle bracelets. With such an overwhelming abundance of applications, the U-MARQ GEM-CX5 is perfect for any retail establishment offering personalized jewelry, memorabilia and/or gift items. The U-MARQ GEM-CX5 features a removable flat engraving table measuring 9” x 7” (231mm x 182mm). The flat engraving table helps facilitate the mass production of flat items, such as trophy plates, identification tags, nametags, signs and more. Furthermore, the flat engraving table is used in conjunction with the precious metal cutting kit in order to produce gold, silver or platinum jewelry nameplate cut-outs. The precious metal cutting kit (SST-8035) includes: 4 precious metal cutters, two 4oz. bottles of U-MARQ cutting oil, 2 rolls of double sided adhesive tape, a sacrifice sheet used to protect the engraving table, a can of compressed air and a micro fiber polishing cloth. This application is quite popular in the jewelry market, since traditional methods of creating nameplates involve casting the precious metal in a mold, which is both a tedious and time consuming process. The optional swarf extractor (SST-589); paired with a vacuum system, will also ensure that the cut particles are collected for reuse rather than wasted. This streamlined process now makes it possible for shop owners to offer their customers a same day turnaround time while ensuring that excessive time is not spent on any one job. The most practical method for securing items in the GEM-CX5 engraving machine is with the use of its multifaceted, adjustable vise. The center vise can open up to 11” (245mm) in length and can also rotate 180° in either direction. Lighters, key chains, cell phones, dogtags and pendants can all be secured using the included standard jig (SST-584) and 10mm jig pins (SST-562). 20mm jig pins (SST-539) are optional. For other jewelry and gift items; such as medallions, watches and pens, the optional ring/pen jig, watch/medallion jig and jewelry jig set (SST-554) will facilitate placement and increase turnaround times. There is also an optional cutlery jig (SST-582) which comes in handy for securing various forms of silverware, such as wedding knives. Lastly, U-MARQ also offers an optional cufflink jig (SST-8026) capable of accommodating both round and square cufflinks. Regardless of what your intended application is, the U-MARQ GEM-CX5 engraver will most certainly broaden your capabilities, thus generating new avenues of income for your business. Perhaps one the most common uses for the U-MARQ GEM-CX5 is for engraving cylindrical items. 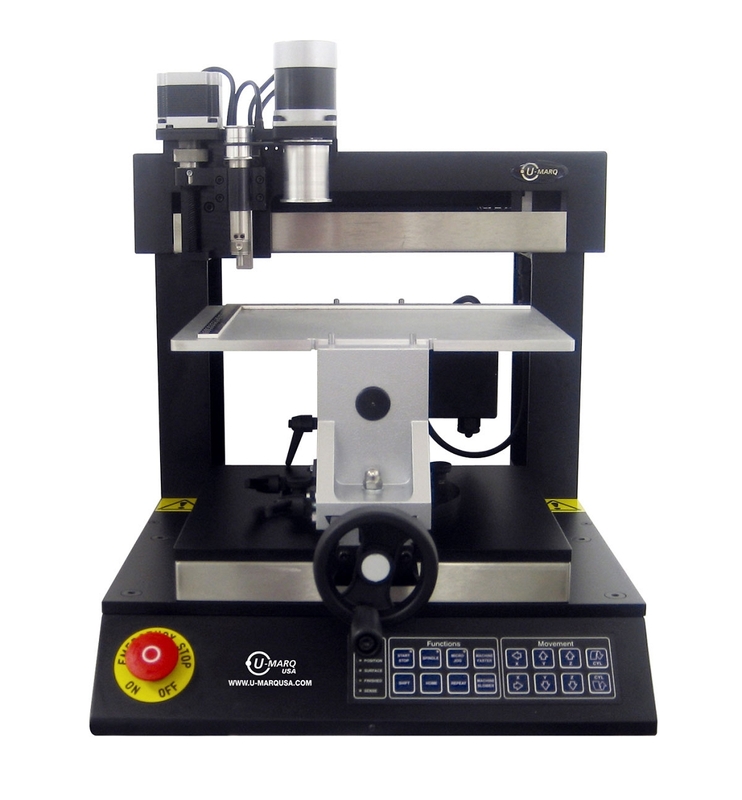 While a typical engraving machine can only move along an X (left to right), Y (front to back) and Z (up and down) axis, the GEM-CX5 possesses yet another motion known as the 4th axis. This 4th axis consists of a motorized vise which is capable of rotating items for 360° cylindrical engraving. On one end of the vise, a flat face plate is installed to support the base of an item and on the other end of the vise; a cup cone of appropriate size is installed to secure the open end of an item. The U-MARQ GEM-CX5 comes with a 100mm face plate (SST-614) and a 50-80mm cup cone (SST-605). An additional 50mm face plate (SST-613), 15-70mm cup cone (SST-609) and 85-120mm cup cone (SST-606) can be purchased separately as well. The vise on the GEM-CX5 can open up to 11” (245mm) and can rotate an item up to 5” (127mm) in diameter. Tankards, mugs, cups, water bottles and small trophies are amongst a few of the items the GEM-CX5 engraving machine will accommodate. With the addition of the glass engraving kit (SST-8090); which consists of 2 diamond burnishers, a bottle of glass cutting lubricant and a micro fiber polishing cloth, the U-MARQ GEM-CX5 can also engrave on wine glasses, champagne flutes, bowls, vases and other cylindrical items that fit securely into the vise. Throw in a set of Rub N’ Buff color fill (SST-7634) and you are now setup to begin creating beautiful color filled engravings. The U-MARQ GEM-CX5 has the ability to engrave around the circumference of many other items as well. The optional ring attachment (SST-522); consisting of a ring chuck, an inside ring bracket, an inside ring diamond, a set of tapered holding pins for inside ring engraving and a set of straight holding pins for outside ring engraving, will permit the GEM-CX5 to engrave 360° around the inside and outside of rings measuring up to 1.1” (28mm) in diameter. Furthermore, the addition of a bangle attachment (SST-565) will expand the engraving parameters of the ring attachment to accommodate even larger items up to 2.95” (75mm) in diameter. Items such as bangle bracelets and hoop earrings can now be engraved as well. As if that wasn’t enough, the U-MARQ GEM-CX5 engraving machine can also engrave around the circumference of a pen. The optional pen attachment (SST-627) converts the GEM-CX5 into a profitable pen engraving machine, enabling you to engrave 360° around the circumference of a pen. Engrave multiple lines of text with ease or implement a complete design that encompasses the entire circumference of a pen. Thanks to the multitude of attachments U-MARQ offers, the possibilities are endless. A little known fact about U-MARQ is their extensive contributions in the software industry. For many years prior to releasing their first engraving machine, U-MARQ was writing software for many of the manufacturers still present in today’s market. This unique opportunity not only gave U-MARQ the foundation by which to generate their own software, but it also served as a way of studying the various pros and cons of other engraving machines and then using that information to design their very own engravers. Needless to say, the GEM Vistool 8 engraving software is a product of many years of experience and commitment to producing the most versatile and user friendly software in the industry. Designing and incorporating logos and images have never been easier. Since engraving machines generally do not read pixels the way printers do, images must be represented as simple line drawings or vectors in order for the machine to recognize a path in which to follow. Most engraving software requires that images and logos be converted to vectors (lines and curves) before being imported for engraving. This requires a time consuming process of tracing or often recreating an entire logo or image from scratch in a separate design software. With the GEM-CX5, the included scanning and vectorizing software eliminates this tedious process and automatically converts imported or scanned images into vectors ready for engraving. Furthermore, an optional photo engraving software (SST-564) allows the GEM-CX5 to also engrave pixel based images, such as jpegs and bitmaps. Photos and portraits can now be easily engraved as well. Vistool 8 also comes complete with 900 engraving fonts and 100 clip art images. With so many options and capabilities packed into a user friendly software suite, it’s no mystery why so many retail engravers prefer the U-MARQ GEM-CX5 over any other engraving machine on the market. Aluminum, brass, gold, silver, peuter, stainless steel, tungsten, glass, crystal, acrylic, plastic, lamacoid, phenolic, resin etc.